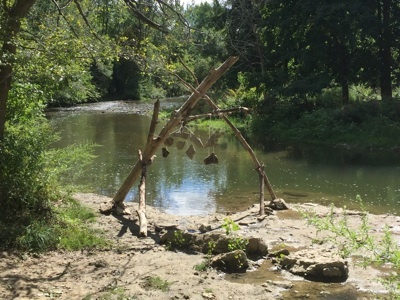 While walking on the trail along Ellicott Greek from Glen Avenue to the Orchard, I found this interesting sculpture made by s very creative person. 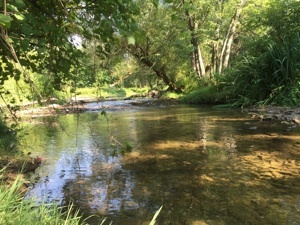 It is located near the fishing spot just upstream of the island area. We will see how long this will last when the spring floods come. Looking at the Island area, you can see at the right of the picture the rocks in the side channel. The water depth was less than 2 inches, which made it easy to cross over to the large island. 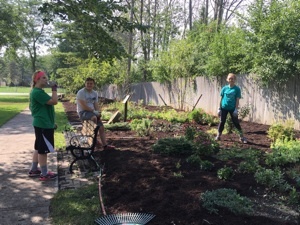 A week later and another group of YES Students arrived to help plant some more annuals and dig out thistles in the North Garden. 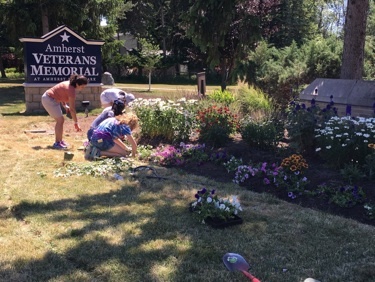 Volunteers and students from the Town of Amherst Y.E.S. 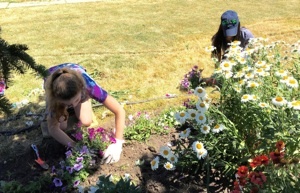 Program (Youth Engaged in Service) help plant petunias in the park. 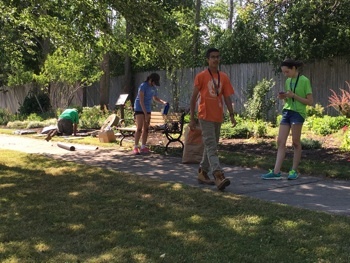 Since 2011 the students from the YES program have volunteered their time and worked to beautify Amherst State Park. 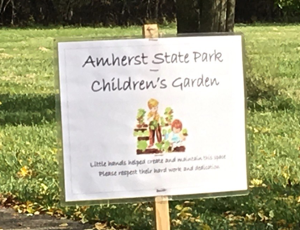 The Amherst Conservation Advisory Council was asked by the Williamsville Earth Day Committee to participate in the activities on May 21. 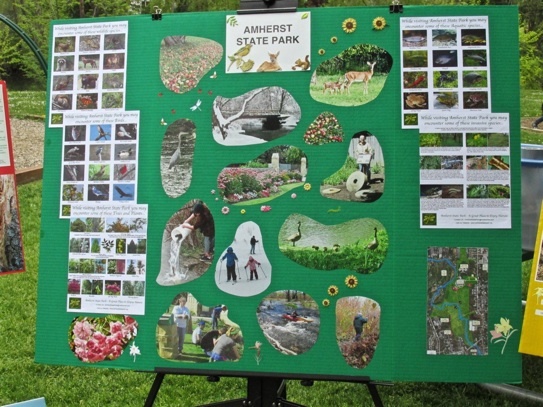 The two posters contained photos of the park and posters of various animals, plants, birds and amphibians found in the park. 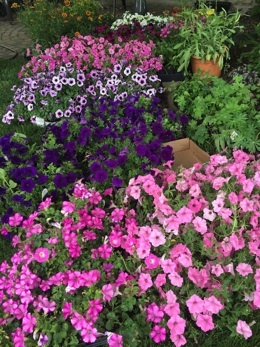 Students from the YES program will plant these petunias shortly. in the front of the park. 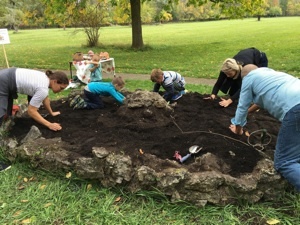 The Students work carefully to prevent breaking the delicate plants. Antonia Stravalaci, Director of the Y.E.S. Program, keeps a close eye on the workers. She also helped them arrange and plant the flowers. I have appreciated her help for the last two years, without which a lot of plants wouldn’t have been planted. 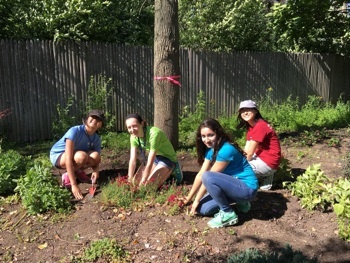 This group of four YES students planted 120 beautiful petunias in about an hour and a half. They are very hard workers. Garden Helpers are always needed to help maintain the gardens. 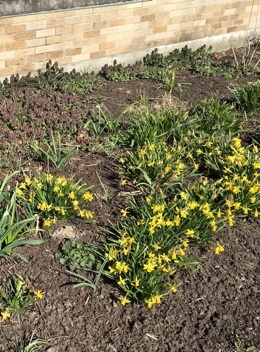 These bulbs had been planted the previous fall by Daemen students. They are such hard workers when they visit Amherst State Park. 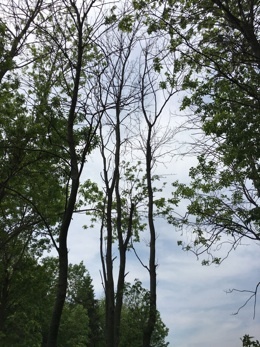 Many of the Ash trees throughout the forested portion of the park have died. They won’t be taken down unless they would cause a safety hazard for visitors on the trails. The dead trees can eventually provide habit for a wide variety of animals and insects. 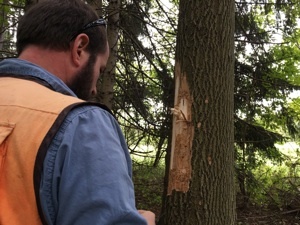 Squirrels, wood peckers, hawks are just a few critters that utilize the dead trees. Here we go! 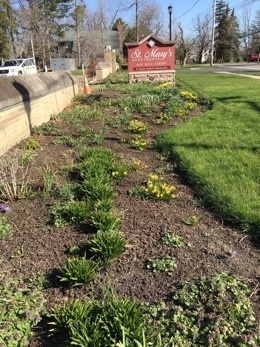 Over 30 flats of annuals and potted perennials are all set to be planted in the “Front Gardens” and the “North Gardens”. Who would have known of the pending drought. The Front Gardens have made it through the hot, dry summer and the freshly moan grass looks beautiful. 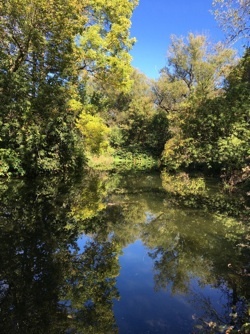 A view from the large island looking up stream towards Glenn Avenue showing one of the favorite fishing spots in the park. The rocks on the far bank are covered with water at normal water levels.. 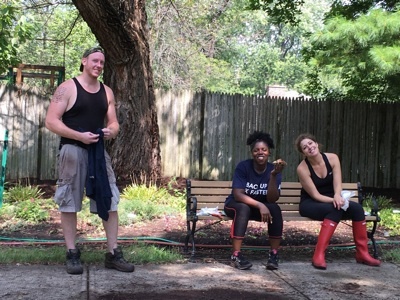 These young folks continued to show up every Thursday at 2:00 PM prompt for the next 9 weeks to help with the gardens. 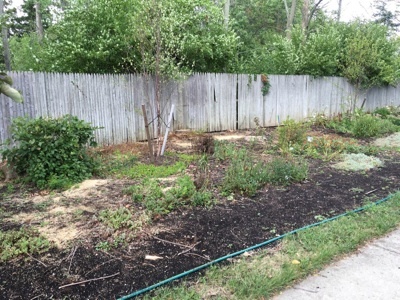 They weeded and planted flowers in the Front and North Gardens, and pulled out dead apple trees from the Orchard area. They did whatever needed to be done and had fun doing it. They were the answer to many prayers. 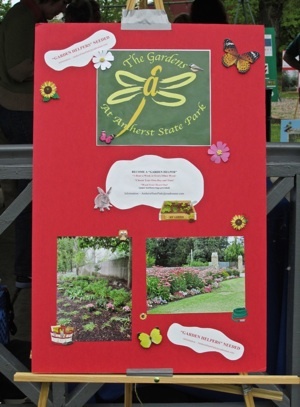 I hope another group will be able to help with the gardens next season. glow in the late day sun..
During the past three years the Emerald Ash Borer had been making it’s way through Amherst State Park as well as much of the surrounding area. 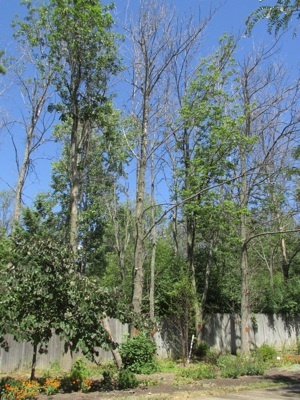 Within 2 years, nine of the ash trees located in the North Garden died. It happened very quickly, and I showed visitors the tiny “D” shaped holes that are the telltale sign that the beetles have emerged from the larval state. The beetles then fly to another tree and lay their eggs. 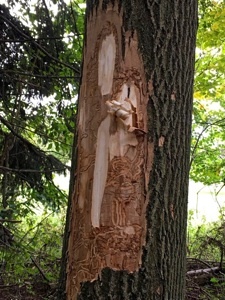 The larvae eat the cambium layer under the bark which cuts off the food to the tree, the beetles emerge, and the tree dies. These trees have been marked with orange paint so the highway crew would know which trees to take down. When that time came, they were careful not to disturb any of the plants in the garden, and they did an excellent job. 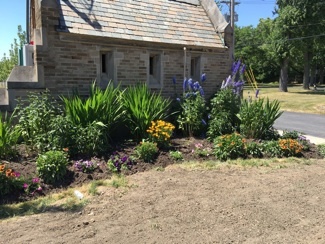 From June through the end of the garden season, several community volunteers helped maintain the "Front Gardens" and the "North Garden". Volunteers are always needed. 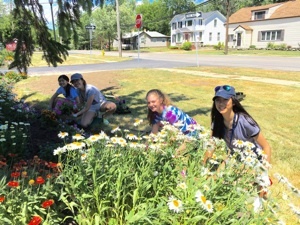 The “Garden Helpers” come once a week on a day of their choosing at a time of their choosing and spend about an hour weeding or doing whatever maintenance needs to be done. 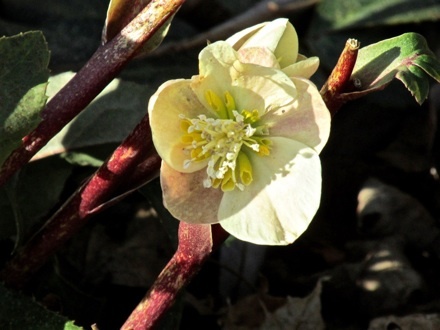 The Hellebores in the North Garden had started blooming during the winter and came to full bloom by February 28. 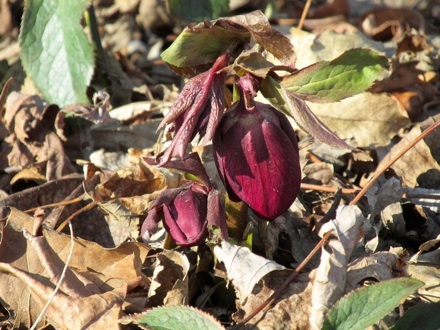 This beautiful red hellebore was just ready to open. 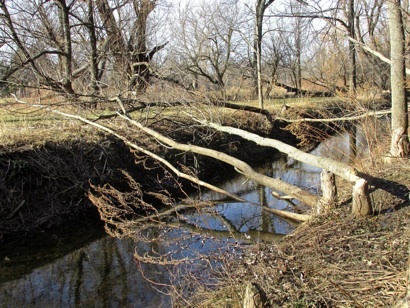 Those pesky beavers got in on the action by taking down 7 trees along the drainage ditch to Ellicott Creek. The small plants would become huge as the summer went by. 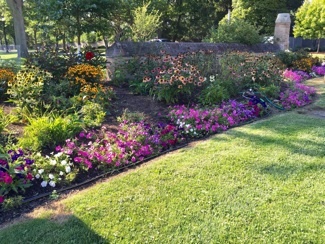 This photo was taken a month or so after the students planted the petunias. The gardens looked absolutely beautiful at this point in the season. 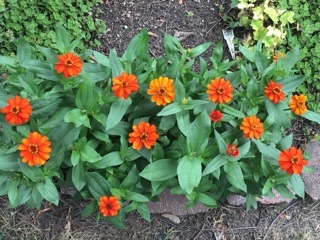 Some of the plants grew to two feet in diameter and were a bright addition to the gardens. 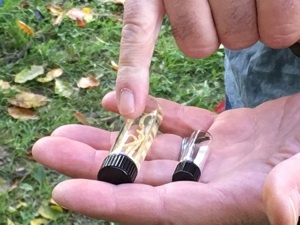 Invasive species are a problem throughout the area, and several aggressive species are found within Amherst State Park. 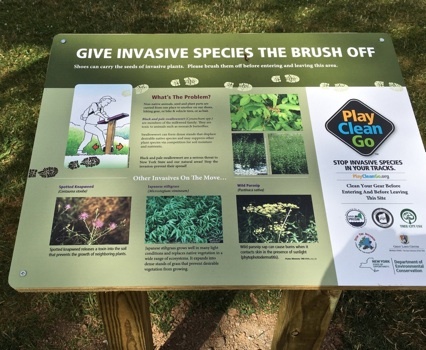 At the end of June a graduate student from Buffalo State College requested to place a “boot brush” at the entrance to the lower park area. 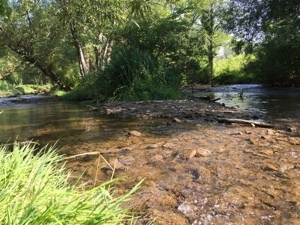 The project was sponsored by an organization known as “PRISM” or the Partnership for Regional Invasive Species Management. 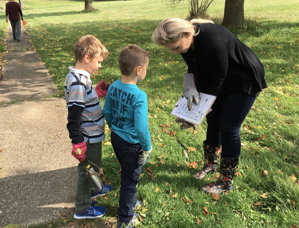 The idea is to collect seeds from plants that might be picked up on one’s shoes as they walk through the park. 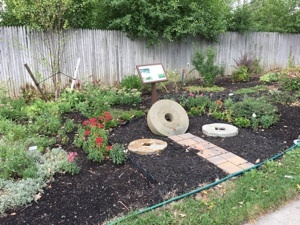 The trays are collected periodically and the seeds are studied to see if invasive specie seeds are being spread as people walk through the park. 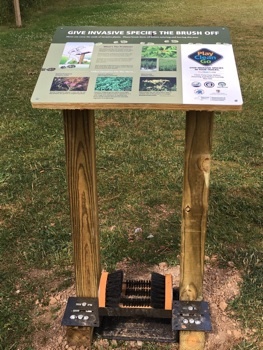 On July 7, the boot brush was installed next to kiosk at the top of the orchard maintenance road. 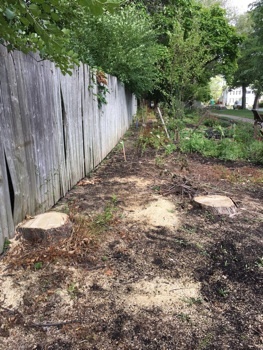 The stumps were left so a stump grinder didn’t have to be used. That would have really dug up the garden. It seemed strange having so much open space. It doesn’t look too pretty at this point. It will look better soon. Finally, they all got together for a group photo. 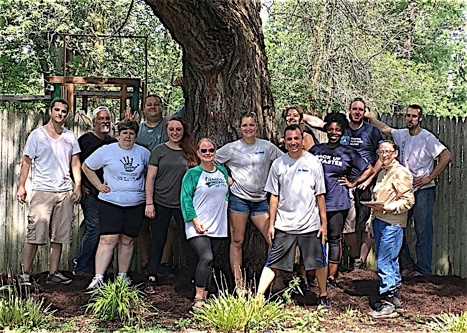 Thanks to Kimberly Case at Ingram Micro for arranging this “Community Day of Service”’ and a big Thank You to all the volunteers. 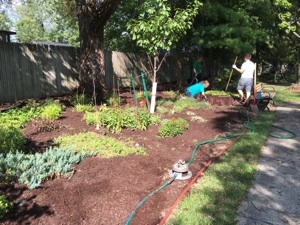 Unfortunately I didn’t get a photo of the volunteers working hard to lay the weed barrier and spreading the mulch along the rear fence. My bad. But I did get a photo of them enjoying some well deserved LaNova pizza and wings. 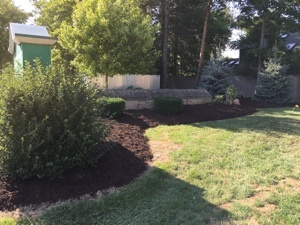 The timing was critical for the trees cutting and mulch delivery since the Ingram Micro employee volunteers were set to arrive on August 25. Everything worked out perfectly. 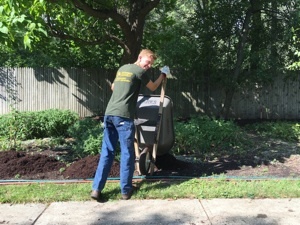 Four very large loads of chocolate mulch were delivered, and we ultimately had to bring in one more load. 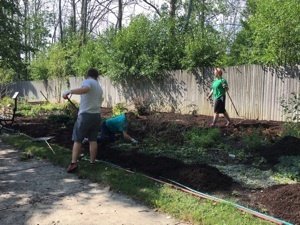 Ingram Micro employees had volunteered to lay weed barrier and spread all the mulch. Considering the heat, they were brave souls and got the job done in short time. 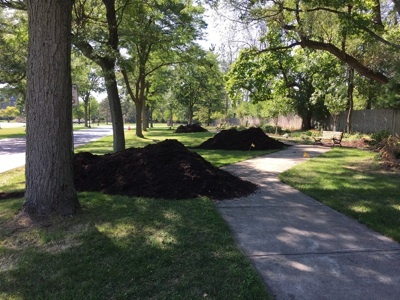 The trees have been cut and the wait is on for the mulch to be delivered. Group photo time. Thanks so much for your hard work.. Taking a break after a hard morning’s work. TA-DA! 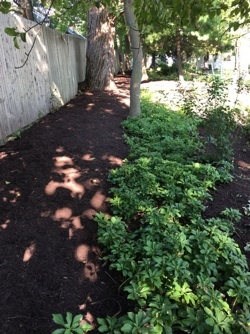 A beautiful job that has improved the garden’s beauty and will hopefully help us maintain the area by keeping the weeds down. 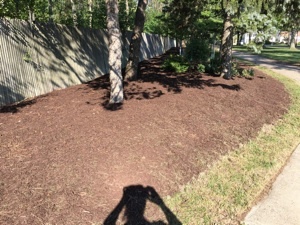 Just enough mulch left to finish with the front portion. Whew! Finally done! This is one HUGE garden. 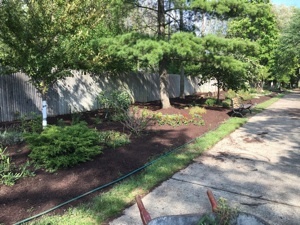 Not many more loads to go..
mulch really makes the green foliage “pop”. Looking down to the other end of the North Garden. You can see how beautiful it looked. I couldn’t believe how fast they got it done. 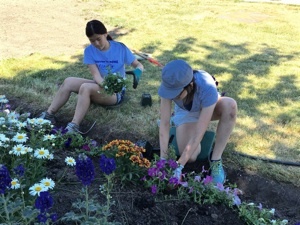 They weren’t use to doing this kind of volunteer service, but they really got into it. 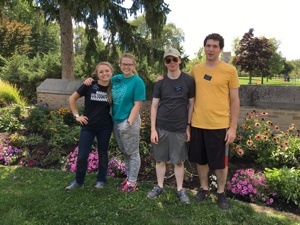 About an hour after the Ingram Micro folks left, a group of four young missionaries from the Church of Jesus Christ of Latter Day Saints arrived, as they said they would,to help finish off the mulch project. There was one hugh pile left over at the far end of the garden and they worked hard to spread that pile on the front portion of the garden. As usual, they did a great job, Thanks, students!!! Thistles, thistles, never have I seen so many thistles. And they Hurt! Heavy gloves are definitely needed. 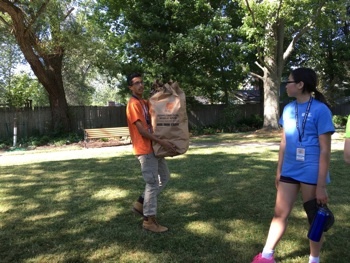 It is so nice to have young people help out with the planting and maintenance of the gardens at Amherst State Park. 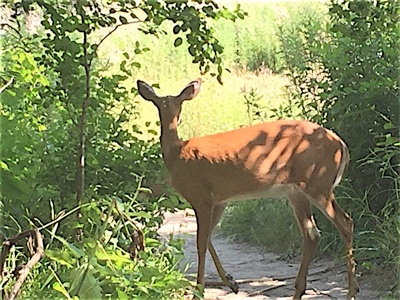 On a hot sunny July afternoon, I was walking on the trail along Ellicott Greek from the Orchard to Glen Avenue, I came across this deer enjoying this shady area and feeding on some tasty leaves. 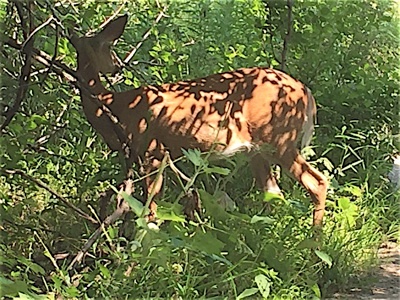 When I first saw this deer, I stopped and got out my camera and started taking pictures. 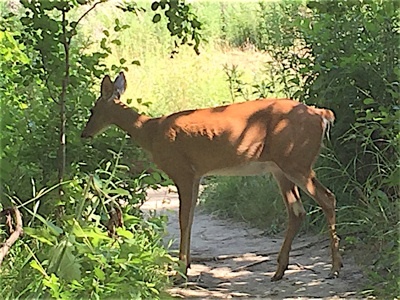 I was able to slowly move closer to within 20 feet of the deer. 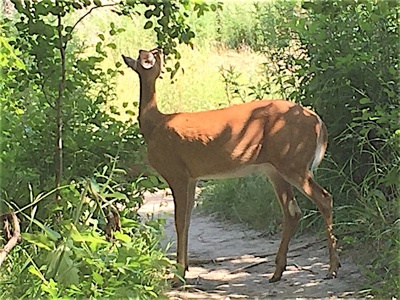 The deer was so busy eating and enjoying the shade that it did not care that I was there. The deer would look around every so often and looked right at me a couple of times. I stood still, made no noise and took in this beautiful, peaceful sight for over 15 minutes. The summer of 2016 was very hot and dry. 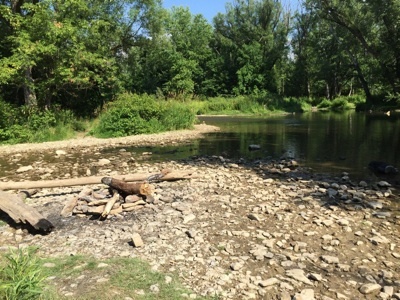 All of western New York was in a severe drought. 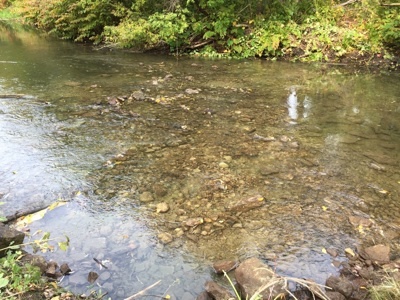 The level and flow of Ellicott Creek dropped throughout the summer. 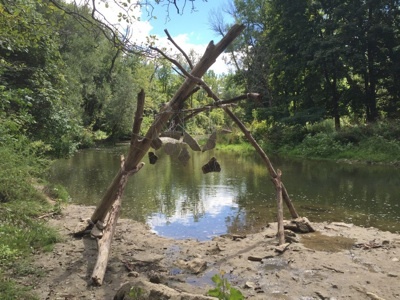 By early August the water level of Ellicott Creek was down about a foot or more. These pictures were taken upstream of the island area. 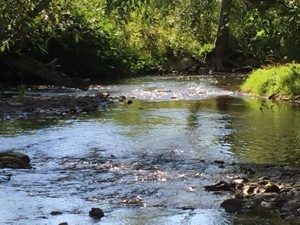 Looking down stream at the main channel of Ellicott Creek from the tip of the main island. There was hardly any water flowing in the side channel. You could walk along most of this channel. You can see how low the water is between the large island and the small islands. 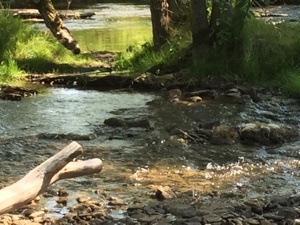 The island in upper part of this picture is actually two islands when the creek is at it’s normal level. A view looking up stream from the large island looking the small islands. 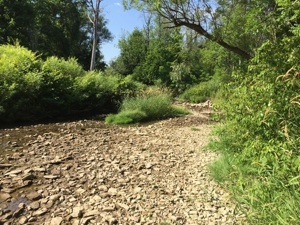 The side channel of Ellicott creek was very low. - Food sources including native plants, seeds fruits, nuts, berries and nectar. 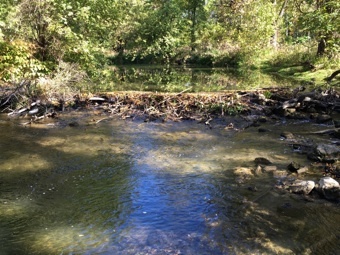 - Water Sources including Ellicott Creek and wetlands. 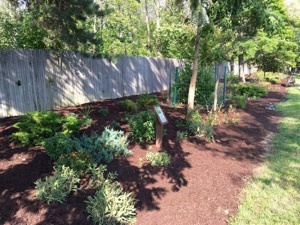 large variety of perennials and vegetation. 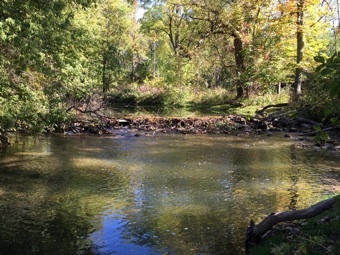 (west of the creek) and riparian corridors along the banks of Ellicott Creek. entrance roadway and others throughout the park. 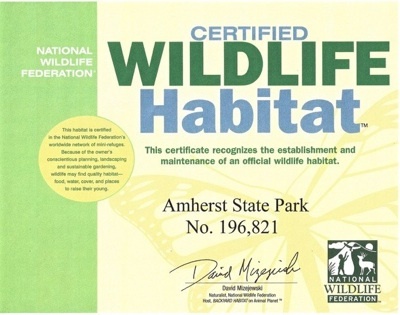 Signs will be placed throughout the park this season to identify the park as a Certified Wildlife Habitat. 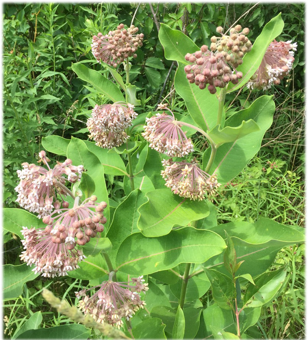 Volunteers have been working to attract Monarch Butterflies to the park by spreading milkweed seeds throughout the area. 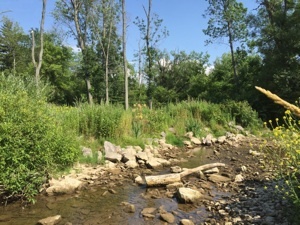 You may have noticed a sign alongside Ellicott Creek indicating a “Monarch Conservation Area”. 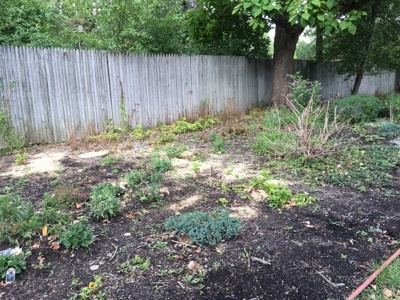 The area contains milkweed, Joe Pye weed and False Sunflowers on which the Monarchs feed. Monarchs are decreasing severely and help is needed to protect them. As the summer moved on the temperatures soared. The hoses were put out and the watering began. 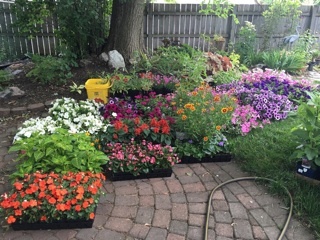 Even with a good watering a couple times a week, it was hard to keep the plants alive. 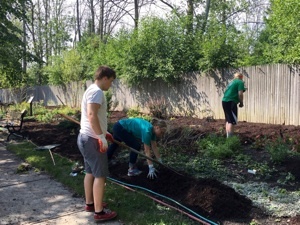 The volunteers kept up with the weeds as best they could. 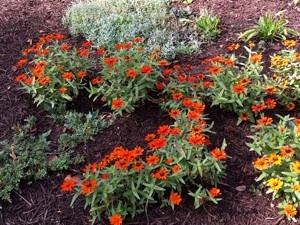 Weeds, of course, flourish in the hot, dry weather conditions. For the most part, folks tried to stay cool and only came to the gardens in the evening but we kept the gardens going. 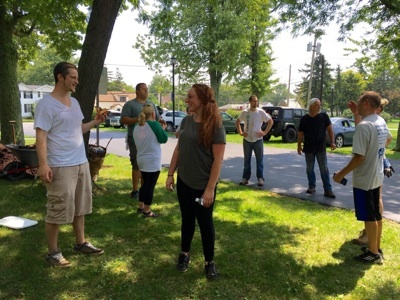 By mid-August the weather started to cool off a bit and we could get back to work. About August 18, the highway crew came out to cut the trees down. 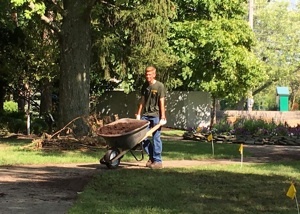 It was a hard job because it was still very hot and the ash trees were big and tall. It took three days to get them all down and cleaned up, but they did an excellent job. 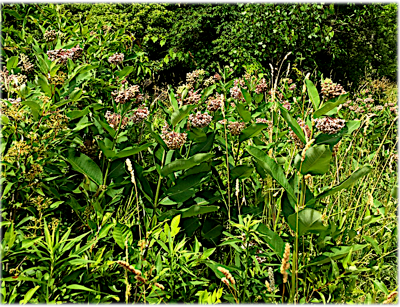 Common Milkweed in bloom during w=early June. 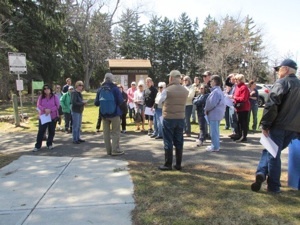 The first of our two scheduled Walk and Talk programs, “Bird Watching for Beginners - Fall Migration” presented by Jajean Rose-Burney, took place with a large group of bird watchers on hand. It had been a clear night, the temperatures were cooler, and as might be expected, the birds had migrated out of the area. That seems to be the way it works, but we all had a great time and Jajean explained a lot to us about the skill of bird watching. 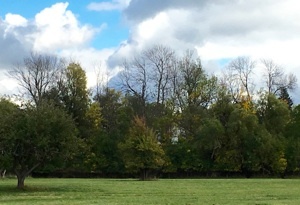 The dead ash trees are readily visible along the east tree line in the Orchard area. of larval damage to a tree. Looking south from the Orchard Area, the damage is very evident. 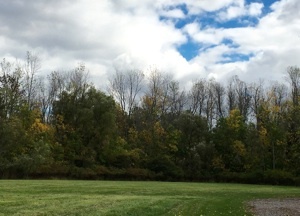 The crown height of the tree line will be lowered by about half as a result of the dead trees. due to the large number of affected trees, they will not be removed unless they pose a safety hazard in the park. 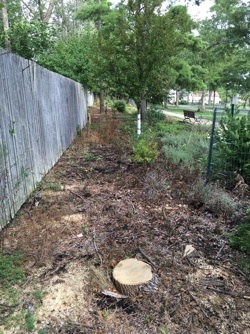 The dead trees will provide new habitat for various birds and squirrels. 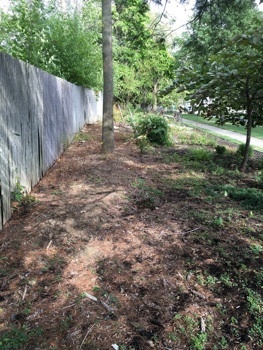 As the forest crown opens up, new trees of differing varieties will be able to sprout and grow. Over time, a forest may go through many changes as the environment changes. You can see where the larva have been eating away at the cambium layer just under the bark. Another tree in the same area. You can see the lines made by the larva. 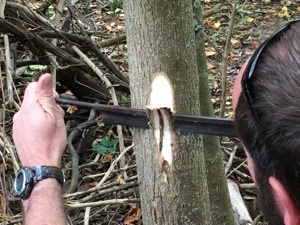 They eventually prevent the nourishment from getting up into the tree and the tree dies from the crown down. You may also see small sprouts that look like saplings coming up from the bottom of the tree. That is a sign the tree is trying to survive. 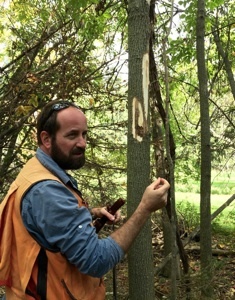 These larva burrows will eventually girdle the tree cutting off all food supply. The vile on the left contains larvae. They can get fairly large -over an inch long. The vile on the right contains a beetle. They are quite small, only about 1/2 inch. You can see it at the base of the vile. The insects are a beautiful iridescent green color. Too bad they do so much damage. Once their food supply of ash trees is gone, they move on to the next area. Sometimes before the tree actually appears dying a clue is provided for infestation. 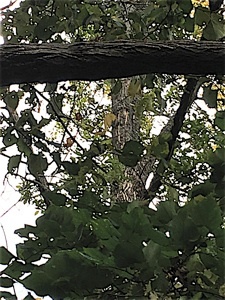 i you see “white” vertical stripes on the bark, it is a sign larva are under the bark and wood peckers are trying to get at them. You may see this a year or so before the leaves in the upper part of the tree die and fall off. Jerry came across a beaver dam across Ellicott Creek. it was fairly large and created a beautiful fishing pond behind it. The Amherst Highway department came in a few days later and removed it. Unfortunately, a dam like this would cause severe flooding in a heavy rain event. The beavers actually created a beautiful reflecting pond. Such a lovely view. Hmm. I wonder if there were any fish gathered there? 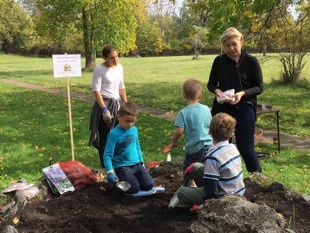 "The Children’s Garden”, located at the base of the stairway at the park, is created. 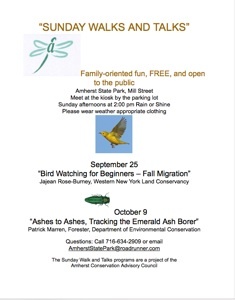 Many thanks to ACAC member Elizabeth Graczyk Dagostino who has organized the project. 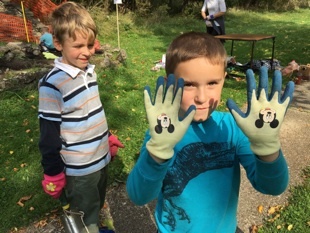 Everyone showed up on October 16 for the bulb planting. 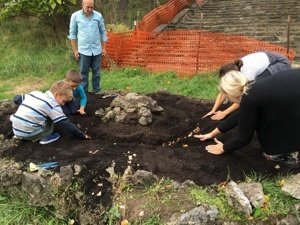 The children and adults planted about 300 bulbs in the circle garden in hope of a glorious burst of color come the spring. 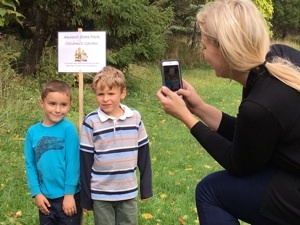 Elizabeth shows the diagram of bulbs to two of her boys. 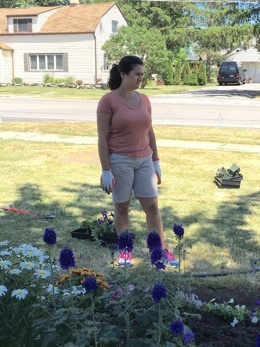 Look at my cool garden gloves! 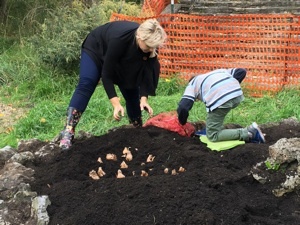 There were large bulbs to plant, too. Everyone works very hard. Cookies and apple juice await the workers upon the project completion. Trying to space the small bulbs evenly. An official photo of the workers. The Highway Department had to bring in a large excavator to remove the dam. 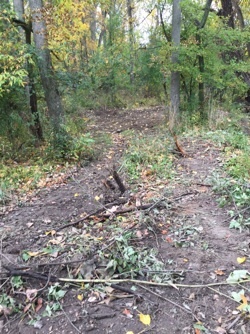 The beaver dam is gone. 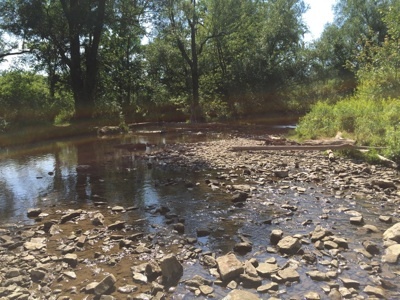 Ellicott Creek has been restored to its natural state, thus preventing some future flooding. 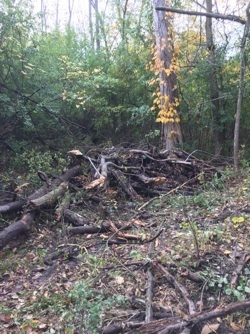 A pile of branches and logs which were removed from the beaver dam.